You can never have too many monsters! 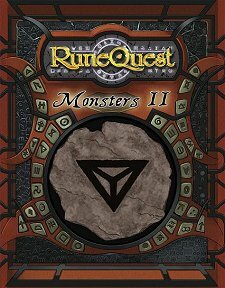 Publisher's blurb: "Following on from the first collection of creatures for the RuneQuest game, Monsters II provides Games Masters and Players alike a new host to populate their Gloranthan campaigns. "The world of Glorantha is amply serviced, with many creatures making their first appearance in this new edition of RuneQuest. From creatures twisted by vile chaos, such as unusual varieties of broo and snakes, through to the great riding beasts of the Praxian plains and Mostali constructs there are many new foes to keep adventurers on their toes. "It will require a stout heart, strong swordarm and incredible cunning to be able to face these beasts and survive! Do you have what it takes?"